Scrolling text is text that moves onto a website page, by following the direction you define for it. It is dynamically displayed and has the properties you have set for this. See the Pen zLarzM by Veronica (@Veronica18) on CodePen. See the Pen VBderY by Veronica (@Veronica18) on CodePen. See the Pen pZKgpL by Veronica (@Veronica18) on CodePen. See the Pen Super Simple Progress Bar by Veronica (@Veronica18) on CodePen. Scrolling text is a quite rarely used feature, only for those cases when it brings real value to the website pages. Scrolling text is practical for blogs where blog authors intend to draw attention to certain posts, by i.e. dynamically presenting their titles on the home page. It is also useful for newspapers that need to bring to the front real-time news and present them as-they-happen. Also, showing users how they progress in scrolling website text might be useful for better engagement with the site content (they know exactly how much they have read and how long it would take to scroll to the bottom of an article). Scrolling Text – How to Add It to Your Website Pages? Let’s tackle the methods of making scrolling text function on your website pages. When readers land on a page, they will be able to watch the text moving (scrolling horizontally – left to right/right to left, scrolling vertically – from the bottom up/from top to bottom, bounce, slide in). How do you implement these? If your site runs on WordPress, there’s one best method for adding scrolling text to a page. Its name is Ditty News Ticker, and it’s a plugin specially created for inserting scrolling text into the website. There’s a wide number of plugins available for scrolling text, we’ll speak in this article about the most trusted and completely functional one. In the WordPress Admin dashboard, go to the Plugins section -> Add New and type Ditty News Ticker into the search box. b. Click on Install Now. d. Check whether the plugin is part of the installed and active plugins, by going to Plugins -> Installed Plugins. e. In the WordPress Admin dashboard, a new section has been added to the menu: it is titled News Tickers. By clicking on this section, you can go to the dashboard dedicated to creating and customizing a new ticker. f. Click and Add New New Ticker, to create scrolling text in a certain part of a webpage. It should open a dashboard as the one in the screenshot above. g. Start by giving a name to the news ticker, to facilitate the management of scrolling texts in different portions of the page/website. h. Customize the news ticker, before applying it to the page in the website. You have to add in the dedicated field of this tab the text you want to submit to a scrolling movement. If wanted, you can add a link to the scrolling text. For doing so, you must specify the URL of the destination page/page section, and select whether the link will open in the same tab or in a new tab. Specify the direction the text will scroll to, when the animation is activated: left, right, up, down. Set the speed at which the text is scrolling onto the page. Larger values equal a speedier scrolling of the text in the respective section. Select the type of rotation for the ticker: fade, slide left, slide right, slide up or slide down. When all customizations are in place, click Save/Update the ticker with the new properties. You will find a shortcode (in the customization dashboard) that you need to copy and paste into the page where you want the scrolling text to appear. After having applied the shortcode to the page section dedicated to scrolling text, save the changes and see the results. You will have a nice text scrolling on the page (left/right, up/down, depending on how you have set it), at the speed you defined into the dashboard, and scrolling in the direction you specified there. 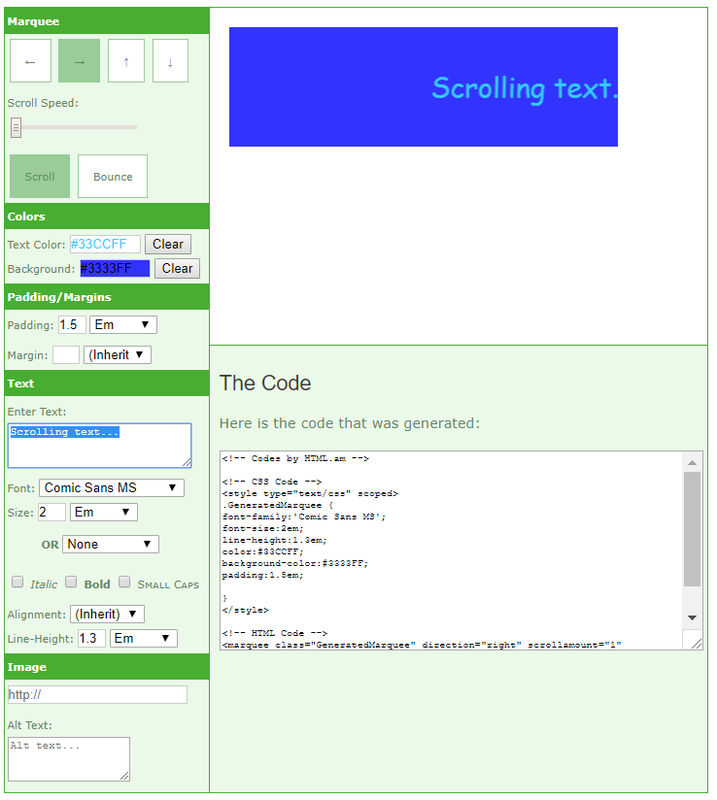 For more ease of use, you can opt for a HTML code generator (marquee generator). You have the possibility to enter the text you want to submit to a scrolling movement, and adjust its properties directly online, in the code generator. This marquee generator can be found here. You also can apply a scrolling effect to an image. Specify the URL of the image and the alternate text for that image, and the selected image will have a scrolling movement into the page. c. Behavior – the “Behavior” attribute creates a certain movement type for the text concerned by this tag (different behaviors are: scroll, slide, alternate). Classic scroll means the text is infinitely scrolling. Slide means the text is scrolling up to a point and then stays in place. lternate means the text is scrolling up to a point and then bounces back to an opposite scrolling movement. g. Scrollamount – the attribute refers to the speed at which the text is scrolling on the page. A higher amount relates to a speedier scrolling, while smaller values relate to a smoother scrolling movement. Please note that this method (using the Marquee HTML tag) is deprecated and is not recommended for use in current websites. The information above is purely as a rough guide that should make you aware of what properties to follow when creating scrolling text. This is the best method to create scrolling text. It is compliant with the W3C standards; however, it takes a little more time and effort to write the code. We’ll explain you how to create this code, by highlighting key aspects of the coding lines. The CSS marquees are formed using CSS animations and the @keyframes rule. animation-fill-mode = defines the values applied by the animation outside the time it is playing. The @keyframes rule defines the style of the text, at different points throughout the animation, while this is playing. It contains selectors and declarations. Selectors are used to define different points along the iteration, they can be from/to keywords, or they can be expressed in percentages. Declarations represent the set of properties and values specific to that @keyframes rule. They are marked by curly brackets. For the code to be created correctly, use translateX for a horizontal movement of the scrolling text, and translateY for a vertical movement of the scrolling text. When users land on a lengthy page, especially on blogs, it’s worthwhile to include a progress bar that notifies them of the reading progress and hence, engages them further into browsing the page. This time, scrolling text is executed by people, and there’s a visual “counter” signalling them what amount of text they have been scrolled/what amount of text still needs to be scrolled. For websites build on WordPress, there’s a quick and easy way to add a progress bar to the lengthy pages you find useful for the readers to pass through. Again, it’s a plugin, named Worth the Read. a. In the WordPress Admin dashboard, go to the Plugins -> Add New section. b. Type Worth the Read in the search bar and search for the respective plugin. e. Check in the list of active plugins that Worth the Read has been properly installed and activated. f. Installing the plugin adds a new section in the WordPress Admin menu, named as such: Worth the Read. Click on it and start setting the features that define the progress bar in the website pages. You can choose to display the progress bar on specific sections of the website: posts/pages/home page or all of them. The plugin comes with several options as to the placement of the progress bar. Choose to set it in the upper part/bottom of the screen, or on the left/right side of the screen. A common rule is to place it at the bottom of the screen, and as users have got used to this practice, it’s recommended that you choose this placement. From here, you can set the look, colors, dimensions of the progress bar, as it is shown on the page on which it marks users’ scrolling text. This defines how thick the progress bar will be on the page where it measures the visit progress. The foreground is the part of the progress bar that moves when scrolling. You should set a contrasting color, for the progress to really be visible to users. If set to 100% opaque, the foreground of the progress bar will more efficiently mark the visit progress. However, more stylish effects are possible, when setting a different value of opacity of the foreground. The background refers to the static part of the progress bar, onto which the foreground moves on scroll. Its color can be adjusted to your liking. For practical purposes, there’s an option of the plugin to set the progress bar background to transparent. This option refers to the foreground when scrolling text is stopped. So, when users do not scroll down the page, the foreground will have the color defined from here. Setting up scrolling text into a page of your website is easy. Any of the above-mentioned methods will do, though we recommend you choose CSS animations or simpler, the Ditty News Ticker plugin (if your site is built using WordPress). And users’ scrolling text can also be turned in a simple way to drive more engagement: by inserting a reading progress bar into the webpage. Thus, they will know exactly how they have read and how much they still have to read, and this will keep them on page, with a promise this will not consume much of their precious time. Happy usage of scrolling text!